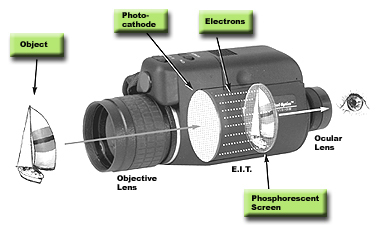 Available light is gathered by the front Objective Lens, where it is transmitted through a set of optical lenses to the Electronic Intensifier Tube (E.I.T.). High levels of energy, produced by the device's complex power supply, knock out electrons from the Photocathode Screen, located on the front of the Electronic Intensifier Tube. This same energy creates a highly static field, pushing the electrons to the Phosphorescent Screen, a sensitive layer, located on the back of the EIT. These electrons strike the Phosphorescent Screen with great speed, causing the screen to illuminate. This process produces an image, which is then magnified by the Ocular Lens located at the back of the device. By looking through the ocular lens you will see the image as if you just looked through a regular optical device, except the image will appear in a monochrome green color. Finally, the Ocular Lens provides adjustment for your particular eyesight, while the Objective Lens lets you adjust the focus according to the distance of the object you are viewing.